“Lobster,” he offers voluntarily when touched on the subject of name-calling. 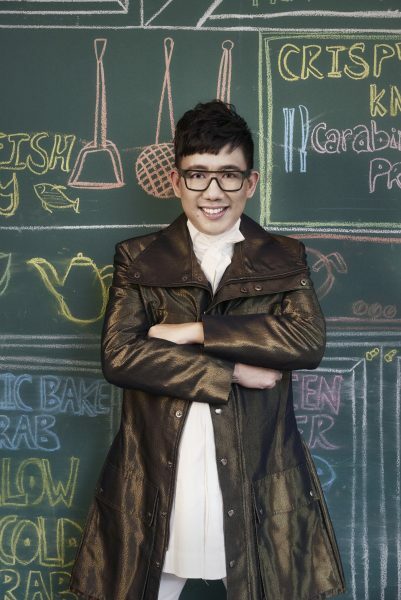 Seated at rooftop destination Aura that overlooks some of Singapore’s iconic landmarks, Daniel Boey is casually clad in black with eyes that twinkle behind eyeglasses that are seemingly designed to embody a fashionable pair of ski goggles – something only Singapore’s Godfather of Fashion can pull off. 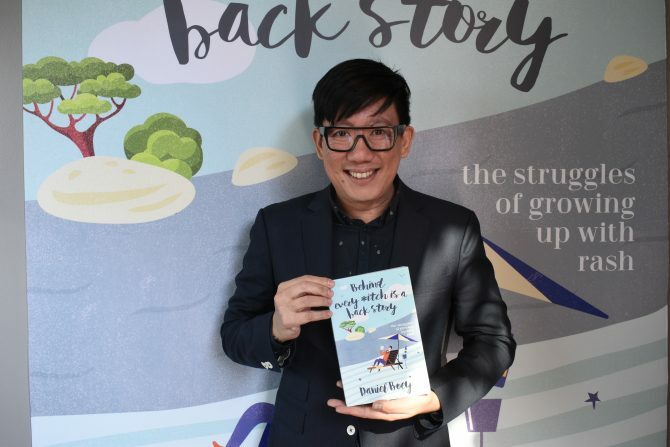 And boy oh boy is Boey laughing all the way to the realm of publishing with a hilarious tell-all memoir that documents his adventures of eczema, rash, sinus and allergies. 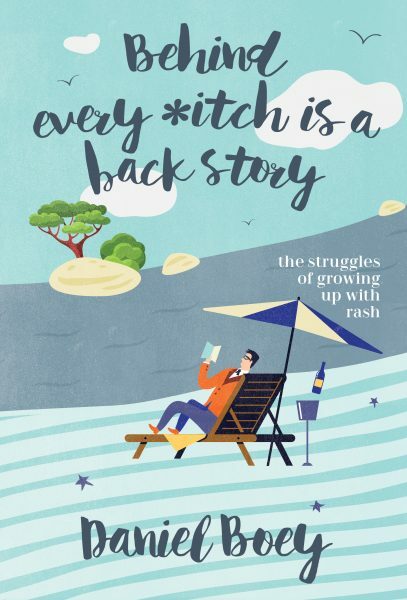 From his childhood days when his mother foraged fervently for a cure to that one time he suffered a fainting spell in the army, the fashion guru reveals every rash-related story in his second book, Behind Every *itch Is A Back Story. But are these stories a bit T.M.I? Boey’s twinkle has intensified to a flash of conviction, rebellion if we may, illustrating the innate grit that led him to his revered standing in the fashion industry – a ruthlessly image-driven world where a skin-peeling, red-touting, sinus-sniffing newcomer will most likely fall prey to the wolves of malice and cattiness. But like Destiny’s Child, Boey is a survivor. And his latest book is a testament to that. Kinokuniya, Times, MPH and Popular bookstores. What inspired you to write your second book? When I wrote my first book (The Book Of Daniel: Adventures Of A Fashion Insider in 2015), I hadn’t plan on writing a chapter about my allergies. All my close friends said this is such an integral part of your life; you have to include this chapter. So I wrote the chapter in as an afterthought. It was a very hard chapter to write because you don’t know how much to reveal and how people are going perceive you after that, but surprisingly that chapter was one of the chapters that resonated most with people. Then these four NTU students approached me for their Final-Year-Project. They were doing a project with the National Skin Centre called Starting From Scratch. After I did that, I realised this is a story that really needs to be told. A story that people need to read about not just for other people suffering from eczema, but also those who do not suffer eczema. I think a lot of people have pre-conceived notions of eczema sufferers. Like the first thing I want to tell them is it’s not contagious, you’re not going to get it by touching another person with eczema. Could you briefly describe the creative process of the book? This was quite hard to write because what do you say? How honest do you want to be, what kind of stories do you want to tell, what stories to put in and what stories to leave out…and I must say I wrote it and re-wrote it, and wrote certain parts many times before getting the tone right. If I sound really bitchy and snarky, this means I haven’t come to terms with my condition. And if you want the book to be inspirational, you must set a tone that: I got this condition – so what? I can sit back and laugh at myself about all these horrible things that happen to me, if I don’t let it affect me and just laugh at it, then it just goes over my head. You have punctuated the book with stylish editorial visuals. Tell us more on that. I was inspired by George Michael, he was the first musician who did a music video where he didn’t appear and instead, he peppered it with supermodels. We have rash, we have sinus, so let’s be glamourous about it. There’s always a way to interpret it. I worked very closely with the creative team, I was telling them what I was writing about, and they interpret that in a visual form. The visuals were literally planned as I was writing. On hindsight, we should have waited till I finished, then we wouldn’t have to shoot so many pictures and drop so many pictures! (laughs) But it was a whole process and the more pictures we shot, the more in-depth feel they have of the book as well… It was kind of nice to see my stories to be interpreted by another person. While those who are inflicted with the same skin condition can definitely relate to your book, how does it appeal to the rest of us? What can we take away from it? If you’re so perfect in that way, hopefully, you have a bit more empathy for people who are less perfect than you and realise that life is not hunky-dory for everyone. Likewise with us, we may suffer from eczema, acne and all that, there’ll always be someone with a worst condition than us. We should not see ourselves as victims. Eczema has put you a through a rather hellish time growing up, and now you’re baring it all in this book. How does putting a spotlight on this vulnerable side make you feel? I’ll be lying if I said it was an easy project. It was quite scary. I literally have to tell myself that if I’m going to write this kind of book, it has to be a very honest book, no half measures about it. You have to be honest about it. If you want eczema-sufferers to able to relate to you, you have to be honest, you can’t lie about these things because they are going through the same thing as you. It might be a completely different kind of feel, or they may have different experiences, but the emotional part of it is still the same. Out of all your eczema-ridden stories, was there one that defined the rest of your life? Could you share more? I don’t really think there is one, every single attack that happened at different stages of my life taught me something. From the time I had a heatstroke in the army and the attack in the university to all the attacks in the fashion industry and even the latest attack when everyone thought I had aids and was going to die, whatever that happened in the different stages of my life – you are in a different mindset, and it touches something new. Is there a valuable lesson you’ve taken away from having eczema? You are responsible for your own life. If you get an attack and then crumble and hide from the world, the only one who is going to feel miserable is yourself. You just have to force yourself. You decide what you wanted to do, make of your own life. If you’re gonna wither away and hide, you make that decision. If you can, would you ever wish that you didn’t have eczema? Yes. But if not for my condition, I don’t think I would have worked that hard. I think everything that happens in your life is for a reason and it drives you on. And all these obstacles that were put in my way were meant to make me a stronger person. Any words of advice to an eczema sufferer from another? At the end of the day, we are saddled with this condition. There’s nothing we can do about it, eczema cannot be cured. I would say learn as much as you can about this condition. I’ve learnt as much about what triggers my eczema, what helps me calm down. The more you know about this condition, the better equipped you are to fight it. Lastly, do you have a personal hack or tip to combat the onslaught of eczema breakouts? I would say drink a lot of water. If I feel like I’m going to break out, I drink so much that I force myself to pee. I think that by peeing out my toxins, I feel better. And also moisturise!